I was riding my Road King east on US 50 quite a few years back, when I came across a tall cottonwood tree decorated with hundreds of pairs of shoes that had been thrown up into the branches. I stopped and spent a pleasant couple of hours in the shade, contemplating that unusual tree. Nobody passed by in either direction for those hours – I guess they don’t call US 50 the “Loneliest road in America” for nothing. I found out later that whole thing got started when some guy threw his shoes into the tree after a fight with his wife. Apparently, they patched things up and later threw a pair of their new child’s shoes into the branches to join his pair. Throwing shoes into this lonely tree caught on pretty quickly, this being America and us being Americans. As you can see by these photos, by the time I rode down the highway the tree was pretty well festooned with shoes. Yep, I did add an old pair of Asics running shoes of my own. I had that tree in my head a few years later, when I saw Peter Lik’s stunning photo called “Tree of Life” at a gallery in Florida. That tree is located in a Japanese garden in Portland, Oregon and has been photographed by others as well. Aaron Reed has a beautiful rendering of it on his website that looks fantastic as a metal print. I thought Roman Keane would appreciate both trees – and the contrast between them – so I had him put prints of them up on opposite walls in the living room of his remodeled church home outside of Savannah, GA. You can find that description in The Road King Chronicles: Blue Ridge Run. There is an epilogue to this story, with good news and bad news. The bad is that someone cut down the original shoe tree back in December of 2010. Only an idiot could find a reason to do that. 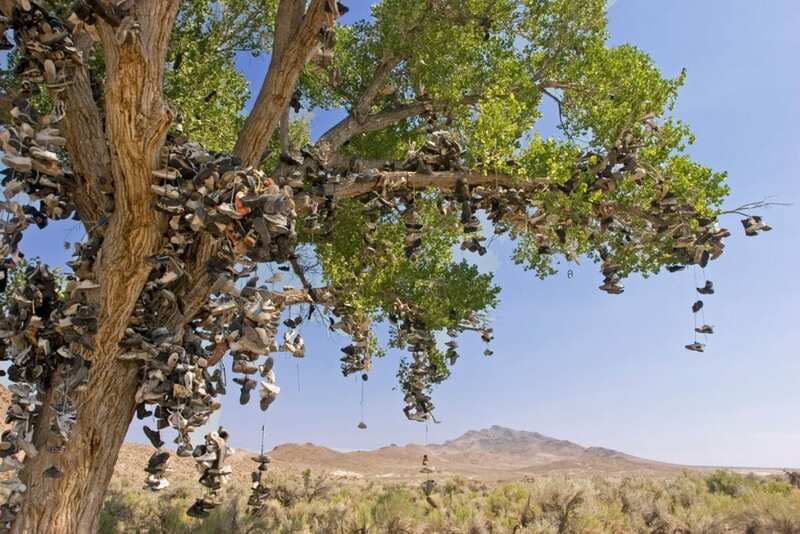 The good is that the locals in Nevada designated another cottonwood as the New Shoe Tree. By this time, I’m sure it’s bearing a lot of fruit.